Cut three pieces of jute about 50" in length. 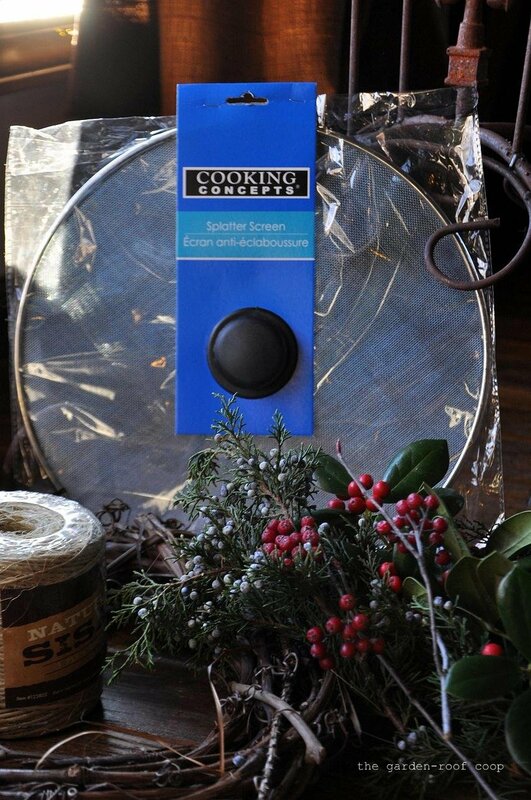 Divide the splatter guard into thirds. 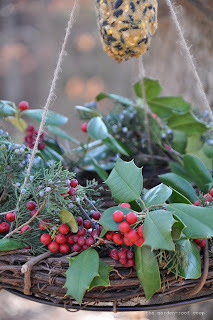 Make three small holes through the screen and connect the splatter guard to the wreath with the jute (the screen will hold birdseed in the finished feeder). I did end up spray painting the edge of the splatter guard brown because the shiny silver was annoyingly obvious. Bring the three strings up and tie into a loop. Braid the remaining string and tie another loop (which will hold the pine-cone). 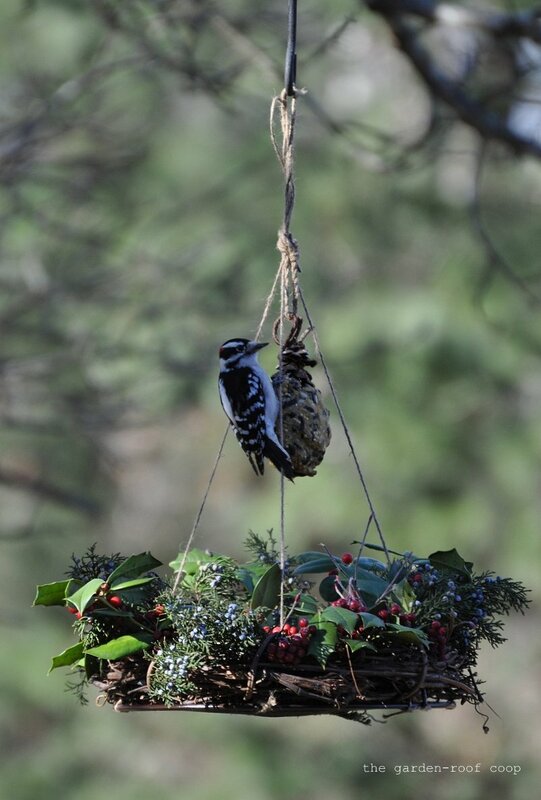 Hang a suet coated pine-cone in the center of the feeder - hang the feeder - watch the action! Awesome!!!! I have bookmarked this idea and will make one as soon as I can get to walmart and the dollar store. You said you made your own suet? Got a recipe? Love all the bird action here, and great bird photos. Thanks for linking up at the Bird D'Pot this weekend. Have a glorious week ahead. PS...would you mind if I shared this link on Next Week's Bird D'Pot mem blog? Wouldn't mind at all :) And I'll post the suet recipe next week! 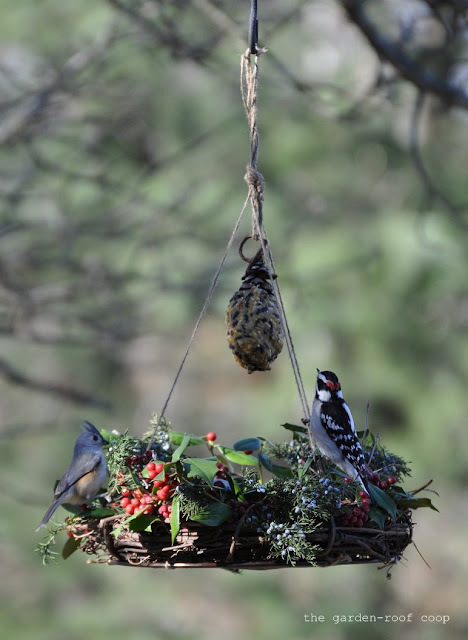 Love this festive feeder! So do the birds! 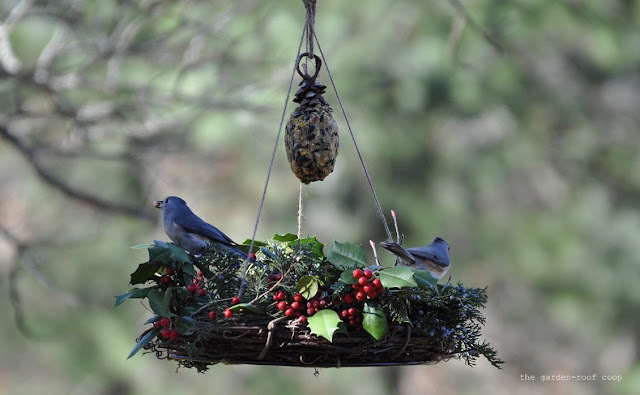 I love the way this feeder is decorated... it is truly living art when your friends come to enjoy what you have provided for them. Handsome bird feeder. Boom & Gary of the Vermilon River, Canada. What an awesome idea! Love it. Will have to try this myself. Thanks! Visiting from WBW. Great! I like this idea. 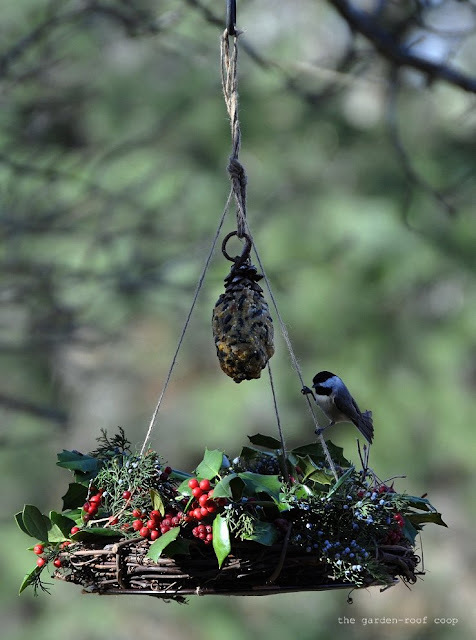 Love the feeder, great idea! Wonderful shots of the birds! YOUARE DOING A GREAT JOB. vVWRY CREATIVE AND TALENTED. I love these wreath bird feeders. I used to give people door wreaths made of bird seed for Christmas but I bought them and I like this style better. 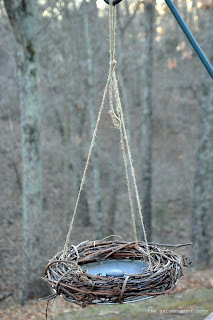 Great ideas there for feeders and I'm sure the birds love them. Birdfeeders for wildbirds are not common here in the country, but we have pet birds inside small cages, though I don't like it as i pity caged birds. Maybe i should try having bird feeders in our property in the province. What a wonderful feeder! I'm sop glad to come here via Nature Notes. Beautiful blog! I'd love to visit often. Wonderful and creative idea for a bird feeder. No squirrel or raccoon nearby to visit your master piece? 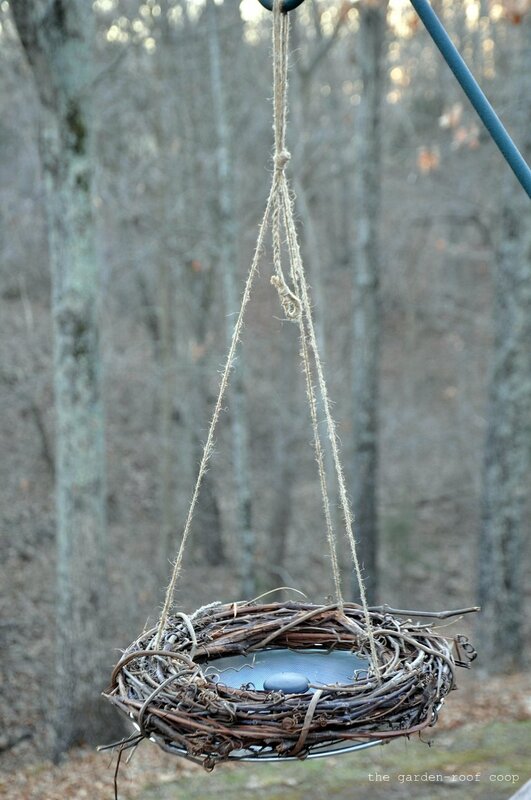 Oh I love this bird feeder and so creative! Very economical as well ~ Great post! hi. 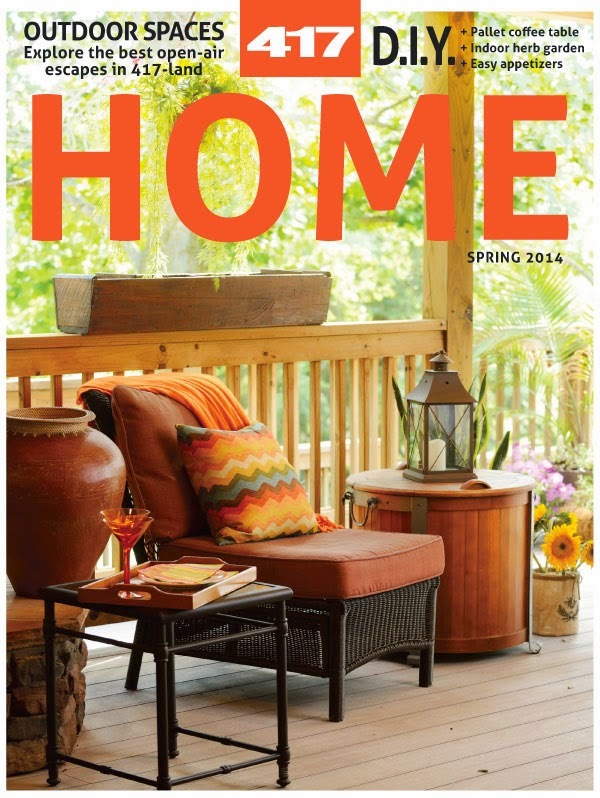 i'm following the "down home" blog hop. i would love for you to visit my blog and follow if you like it. What a great feeder! Not only does it supply food for hungry birds, but it is beautiful to look at as well. Fantastic! What a neat idea for a feeder. Your guests seem to approve! Oh thank you for sharing the to do for this wonderful bird feeder. Birds all over will love it! Very creative - as well as natural and economical ! 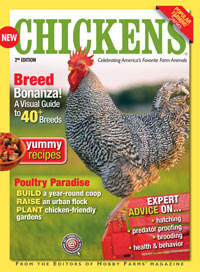 As for chickens - we had some for quite a few years. 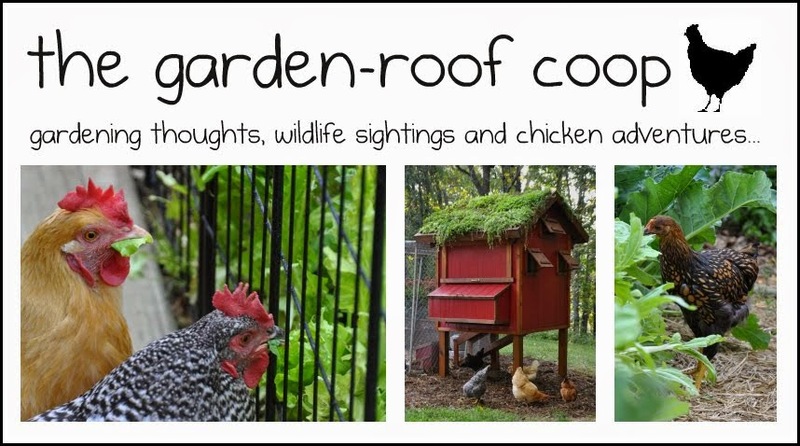 Not to mention a beautiful rooster who did yard patrol duty. 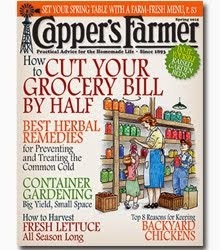 Then our 'chicken sitter' went off to college and we decided to spend winters in the warm south. Kinda miss the sounds in the yard, not to mention fresh eggs every day. Lovely blog - I poked around a bit. This is awesome! I'd like to make one. I came over from I'd Rather be Birdin"
You really got some nice birds to visit that birdfeeder.